The effectiveness of this trick depends on its method of operation remaining a well kept secret. Therefore, don't reveal the secret of this trick to your intended victim. Thank you very much! The Oracle of Batboy appears to be a "magic eight ball" fortune-telling application, however, it has a hidden secret: It can also be used to reveal the identity of any playing card, no matter what the card is! Click here to summon the Oracle. Bookmark that link for showing the Oracle to unwary spectators. In the illustration, note the 3 round buttons labelled A,B,C. To answer yes and no questions, simply press either button B or C. Button B will provide a random answer, and button C will cycle sequentially thru the answers "yes", "no" and "ask again". You can use button C to "force" answers to specific questions. Also note that the face has been divided into 8 octants (rectangles). You'll leave the mouse positioned within these octants in order to specify which card to reveal. Note that the octants are designed to correspond to the facial features. Horizontally the octants are on either side of the nose. Vertically the octants are above the eye, above the top lip, above the first chin, and below the first chin. To tell Batboy which card to reveal, you'll covertly place the mouse over two different octants on his face at certain times. 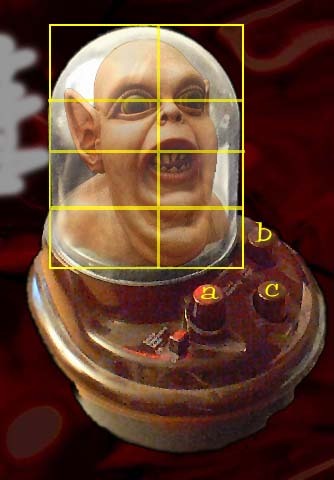 You'll use the timing of Batboy's eye-blinks to figure out when to position the mouse. When Batboy is just sitting there, he goes thru a cycle in which he blinks once, blinks twice, and then moves his mouth. To input a card, use the tables below to figure out the two octants you need to use. Position the mouse inside the first octant and wait for Batboy to blink once. Then position the mouse inside the second octant and wait for Batboy to blink twice. After he blinks twice, you have a couple of seconds to press button A (before he blinks once again). If you press Button A, Batboy will spin around and say the name of the card. The second octant (two blinks) is used to narrow down to a specific card. If you make a mistake, reposition to the first octant and wait for a single blink again. Note that 7 and 8 can be input either as a low card or high card, but have different positions depending on which you specified. For example, to encode the 5 of Spades, you would position the mouse over his ear, wait for a single blink, position below his ear, wait for the double blink. Then click button A to hear Batboy say "Your card is the five of spades!". The method described above works with any card. However, if you can force a card on your spectator (secretly get him to use a pre-planned card), you can simplify things somewhat. 7 of Clubs "Ask Again"
Either use a card-forcing method (look up "forcing a card" on Google) to force one of these cards on your spectator, OR deal these seven cards from the top of your deck onto the table and allow your spectator to choose one. Click here to summon the Oracle.